The Grateful Dead was a unique and eclectic rock band that rose to fame in the 60's. Our Pinball Machine Tapestry is a Grateful Dead tapestry that would be a great dorm room accessory for any college-bound fan of the band. This is a multicolor dorm tapestry that is almost psychedelic in its use of such vibrant colors. The six skeletal figures running across the length of the tapestry could easily signify the six members of the band that were present at the Grateful Dead's peak career. 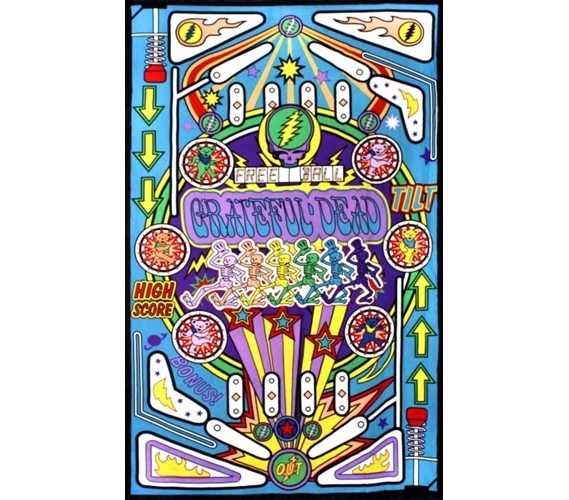 If you love the Grateful Dead as much as you love bright, psychedelic colors, then our Pinball Machine Tapestry is dorm wall decor that is perfect for you. Decorate your dorm room how you like it. If you love classic rock, let it show with your dorm accessories. 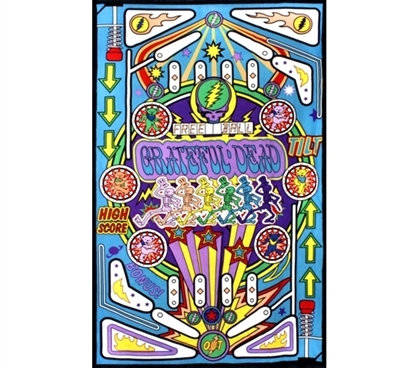 Having our Pinball Machine Tapestry displayed on your walls or windows will easily open the gateway for other Grateful Dead fans in your dorm to strike up a conversation with you about them. What's better than talking to fellow music-lovers with the same tastes as you?! Nothing. And the best part is you can make college friends while you're at it.